Rising sea temperatures have seen new fish species become established in waters around the British Isles, research has shown. 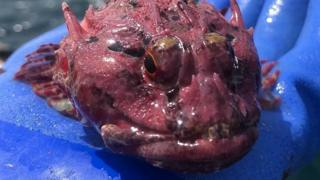 Scientific records, archives and contemporary reports have been combined to build a picture of marine life in waters around the Channel Islands. Since the 1990s a "new wave" of fish species has been regularly recorded, the research's authors say. New visitors include Atlantic bonito, and species of jack and bream. The increase in certain types of fish is being linked to a rise in sea temperatures - with waters around Jersey, the largest of the islands, seeing a 1C rise since 1960. The Atlantic bonito, a popular eating fish similar to a mackerel, have been caught regularly by anglers in summer months, authors of Marine Fish of the Channel Islands say. "Some people go to Florida and they go bonito fishing, so it's a big surprise that every single summer anglers around Jersey, anglers around Guernsey are catching these fish," author Alex Plaster said. The marine geography graduate worked with Paul Chambers, a Channel Islands marine expert and author, to delve into fish records going back to the 1800s. Other trends, including the re-emergence of the endangered bluefin tuna, were unlikely to be linked to rising sea temperatures but warming seas were the main driver behind changing fish behaviour, Mr Plaster added. "It's the winters where you're seeing a massive difference in sea temperatures. "This is allowing some species to stay almost year-round, and also we're getting more and more species from the south - almost Mediterranean waters," he said. Research from the University of Southampton has also suggested new kinds of shark - including the great hammerhead, blacktip, and oceanic whitetip - could migrate to UK waters as the oceans warm. Other new species found in the Channel Islands include the Atlantic saury and spotted sea bass, which are being caught by anglers in summer months.